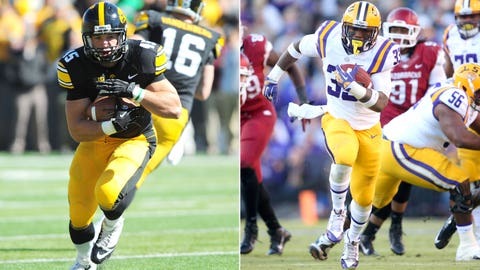 Iowa's Mark Weisman (left) and LSU's Jeremy Hill (1,366 total yards, 14 TDs) combined for six touchdowns during the month of November. LSU ranked 10th in passing defense among SEC teams this season, allowing 265 yards per game. However, of the Tigers’ final four games (Furman, Alabama, Texas A&M, Arkansas), no quarterback — including Johnny Manziel and AJ McCarron — reached that 265 threshold. Which begs the question: How will Iowa sophomore Josh Rudock (2,281 yards passing, 23 total TDs) fare against the fastest (and probably biggest) defense he’ll encounter in Year 1 as a starter? LSU wideouts Jarvis Landry and Odell Beckham. Landry (75 catches, 1,172 yards, 10 TDs) and Beckham (57 catches, 1,117 yards, eight TDs) combined for 16 outings of 90 yards receiving and/or one touchdown, with the latter accounting for 15 catches, 383 yards and four scores against Mississippi State (Oct. 5) and Furman (Oct. 26). 1. Against Arkansas on Nov. 29, LSU’s Anthony Jennings fared well in relief of Zach Mettenberger (torn ACL), engineering a 99-yard touchdown drive to help the Tigers outlast the Hogs. For the season, though, the freshman has logged only 10 passes. 2. LSU notched 27 or more points nine times this year, with Iowa reaching that threshold six times. 4. The Hawkeyes have won three of their last four bowls against SEC foes — including a last-second victory over LSU in January 2005 (Nick Saban’s final game with the Tigers). If Mettenberger were healthy, LSU would be a prohibitive favorite. Instead, there’s a wisp of trepidation in declaring that Iowa won’t stay competitive throughout the game or contain the Tigers’ star trio of Landry, Beckham and Hill.